American Fabrics Arts Building artist Emily Larned discusses her iconic feminist vegetarian bookstore, her union for reflective creative practice, and how publishing ‘zines changed her life as an artist in the community. American Fabrics Artis Building in Bridgeport, CT talks about the value of the artist’s studio for the creative professional who travels frequently. Janet Slom is a talented artist who creates her newest works at her AmFab studio in Bridgeport, CT. Read about her various artistic pieces here. An artist needs a dedicated spot to work - and an AmFab studio might be the perfect option. Located in Bridgeport, CT, our studios are right in the epicenter of of a vast active arts community. 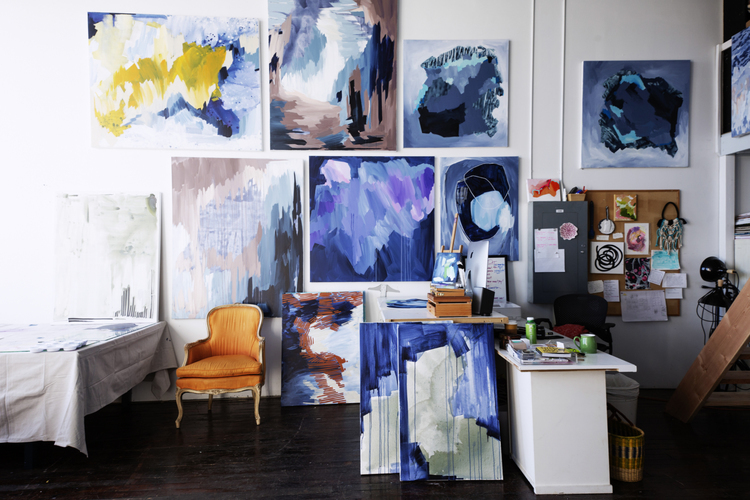 Read on to find out why your own studio space is right for you. Visit your favorite local contemporary artists, and see what they are working on right now! Support the creative community at The American Fabrics Art Building’s Open Studios event November 10th and 11th, 2018! Read more about the event here! Gain a quick and adequate understanding of all things mixed media artwork and what you should look for when purchasing your own mixed media artwork! Delve deeper into Abstract and Expressionistic art and learn the 3 things to keep in mind when building your art collection. We’re sharing some universal techniques artists can use to promote their work. Delicately twisted twigs crafted in luxurious gold are some of Melissa McClure’s most well known works. An accomplished jewelry artist, McClure’s work connects two worlds: her own roots are split between Texas and NYC. That blending of rugged energy and sophisticated sensibilities is a winning combination: delicate organic jewelry with hefty visual appeal. At first glance, it’s entirely possible to mistake one of William P. Duffy’s paintings for a window framing a particularly lovely view. A multi-award winning plein oil painter, Duffy works in oils. His many collectors are particularly passionate about Duffy’s nautical works, but he has painted scenes all around the world, including Ireland and the Azores. With a name seemingly drawn from a woodland forest, it’s not surprising to find Holly Hawthorn’s work full of natural elements. A sculptor, printer, and ceramicist, Hawthorn works in many mediums. Her work is playful and thought provoking, cheerful and memorable. Artist Brec Morgan donating the Open Studios proceeds to the Bridgeport Rescue Mission. Every year, the Bridgeport Art Trail hosts a city wide open studio event that’s absolutely phenomenal. This year was no exception: over 1,100 visitors came to the American Fabric Arts Building during our two-day Open Studio. We want to thank everyone who attended, as well as those of you who shared information about this event: lots of important community building happened because of you.